This last week, a Citrus longhorn Beetle was found in Rutland. This beetle is found occasionally on imported trees, such as Japanese Maple (Acer palmatum). However each finding or interception (as the finding of the occasional beetle is sometimes termed) is treated seriously as the beetle, which is native to China and Japan, has established itself in Lombardy and other parts of the EU. In Lombardy, thousands of mature trees have been destroyed in an attempt to stop the spread of the beetle. The beetle can attack the following trees : Maples (Acer spp), Horse chestnut (Aesculus hippocastanum), Birch (Betula spp), Beech (Fagus spp) and Willow (Salix spp). The adult insect is between 20 and 40 mm in length. It body is shiny black with white markings. 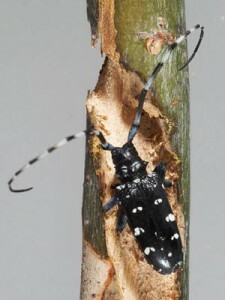 It has distinctive long black antennae which have blue or white rings on them. The adult female lays eggs under the bark of a tree, and when the larvae hatch they bore down into the wood. The tunnels created by the feeding larvae render the tree susceptible to disease (fungal and bacterial infection), they also damage the water and minerals transporting system. These larvae may feed within the tree for two or three years. They eventually pupate and the adult form emerges often in July or August. The Food and Environment Research Agency and the Scottish Government are urging people to be vigilant. If you see a beetle that you suspect might be a citrus longhorn beetle then trap it if possible, and report the finding to FERA (Tel 01904 465625) or email : [email protected] . Recently in a timber wall decoration of a pub at Brasted Kent Nr Westerham I noted tunnelling where the this surface veneer had broken away. The tunnelling and frass appeared to me to be very similar to that of The House Long Horn Beetle (Hylotrupes Bajulus). As the surface has continued to break away I can only assume that it is active. Westerham is of course on the borders of Surrey where this highly destructive infestation is found quite often. I have previously found an exit hole in a table imported from India. My clients had told me they actually heard a noise from the table ?. My inspection revealed that the leg was so badly tunnelled and disguised that I was surprised the leg had not collapsed in a pile of frass and Indian Polyfiller. Horse chestnuts – under attack? Another threat to bees – the Asian hornet.